Unicorns are having a moment! 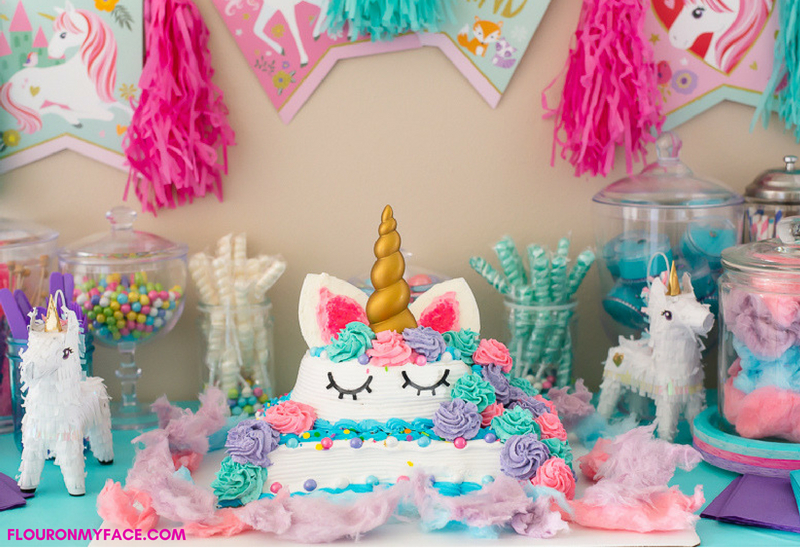 From bachelorette parties to birthday parties, unicorns are all over. Here’s a cake decorating idea from Flour On My Face to make your own unicorn birthday cake at home. – 4 strong rubber bands to close the top of the decorating bags. 1. 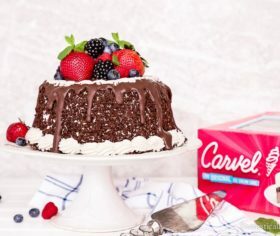 Purchase the Carvel® Ice Cream Cakes and place in the freezer until ready to decorate. You will need to decorate the Unicorn Ice Cream Cake in steps to keep the cake from melting. 2. Prepare 4 batches of Stabilized Whipped Cream Frosting made with gelatin. Make one batch at a time and color 3 of the frosting batches with your choice of gel food coloring (i.e. : teal, pink, violet). Leave one batch uncolored (white) to use to cover the unicorn ears and to patch up any of the white cake frosting on the ice cream cake if needed. 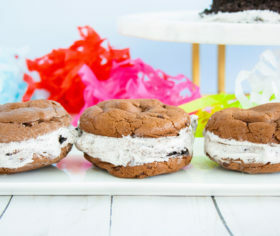 As you make each individual batch of frosting, immediately put it in a 12-inch frosting decorating bag fitted with a coupler and piping tip. Once the bag is filled and closed securely with a rubber band, place it in the refrigerator. Repeat with each batch of frosting. Note, For each batch of Stabilized Whipped Cream frosting, you will need a 12-inch frosting decorator bag, a coupler, and a large open star decorator tip. 3. While the colored frosting is chilling in the refrigerator, use the white frosting to cover the front of the unicorn ears. Use a small offset spatula or a knife to smooth the frosting on the earpieces. If desired, use pink sparkling sugar to fill in the center of the unicorn ears. Place both frosted unicorn ears on a plate in the freezer until you plan on inserting them into the Unicorn Ice Cream Cake. 5. Begin by piping flowers along the front of the unicorn head and along the backside, bringing them down the front corner of the lower cake. Be sure to leave some space between the flowers so you can pipe the next color frosting. Carefully put the ice cream cake back into the freezer for 30 to 60 minutes to keep it frozen. 6. After 30 to 60 minutes, take the ice cream cake out of the freezer and pipe the second color of whipped cream frosting flowers next to the ones you already piped. Return the cake to the freezer again for 30 to 60 minutes. Repeat with the third color of frosting until you are happy, filling in any gaps with frosting flowers. Freeze the cake overnight. 7. 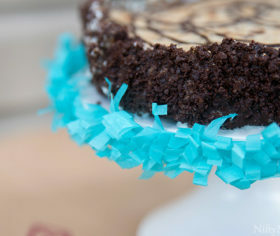 Decorate the cake with a border of the pastel Sixlets or sprinkles if desired. 8. To serve the Unicorn Ice Cream Cake, place the cardboard cake board on the table where you plan on serving and cutting the cake. Arrange the pastel colored cotton candy around the edge of the cake – but not touching the cake frosting (the cotton candy will melt). Insert the unicorn horn if you haven’t already. 9. Cut and serve the cake. Return the cake to the freezer once you have served all your guests to prevent the Unicorn Ice Cream Cake from melting. Serves 20+, depending on slice size. – You will need a large area of freezer space to keep the cake frozen as you decorate and until you serve it. Keep this in mind when you decide what size cake and decorations to use. – If you do not have enough headspace in your freezer to accommodate the height of the unicorn horn and ears, you can add the unicorn horn and unicorn ears to the Unicorn Ice Cream Cake right before serving the cake. – The Carvel Happy Birthday Ice Cream Cake had Happy Birthday piped onto it. I scraped it off with a spatula. You could also use some of the white whipped cream frosting or pipe more flowers to cover it. – Preparing the Frosting: You have two options when filling your frosting decorator bags. You can fit each 12-inch decorator bag with a coupler and a large open star tip. To use this method, you will need four 12-inch decorator bags, 4 couplers, and 4 large open star tips. Or you can use four 12 inch decorator bags for each color of frosting and use a 14 or 16-inch decorating bag fitted with a large coupler and one large open star decorator tip. You will then pipe each color of frosting by placing the 12-inch filled decorator bag with each frosting color, cut a hole in the tip of the 12-inch bag and slide it into the larger decorator bag fitted with the star tip. Once done decorating with the first color remove the smaller decorator bag from the larger decorator bag, wash to remove any colored frosting from inside the star tip and slide the next bag of colored frosting into the larger bag and decorate the cake with that color. Repeat until you have used all three colors of frosting to decorate the Unicorn Cake.